Chemex is perhaps one of the most strait forward coffee brewers that you can get, but it is not like a French Press where you can pull it out of the box, rinse it, grind your coffee, put it in the press, heat some water up, pour some hot water in, wait four minutes, and you have coffee. No, the Chemex despite its easy design, requires a few rather important pieces of additional equipment. What is the additional equipment? The other very important piece of equipment is the beehive shaped kettle with the long thin gooseneck waterspout. This is important because the design allows you to pour a gentle stream of hot water into the filter without sending hot water, and coffee grounds all over the place. A regular hot water kettle has a short and wide spout that just pours too much water out, too quickly. If you are purist, then purchase a Chemex, hand blown glass kettle, but I prefer a metal kettle to glass. A kitchen scale is also handy to have, so you can measure out how many grams you need when you brew your coffee. As always, how much coffee you use, will depend on how much coffee you want to make, and the size of the Chemex you are brewing in. The Chemex comes in 3 cup or 6 cup size. A 3-cup Chemex will take 20 grams of coffee and a 6-cup will need at least 41 grams of coffee. Of course this is a starting point for you, as is always the case for most people, your taste will influence how much coffee you use. If you like it light you use less and if you like it strong then use more. 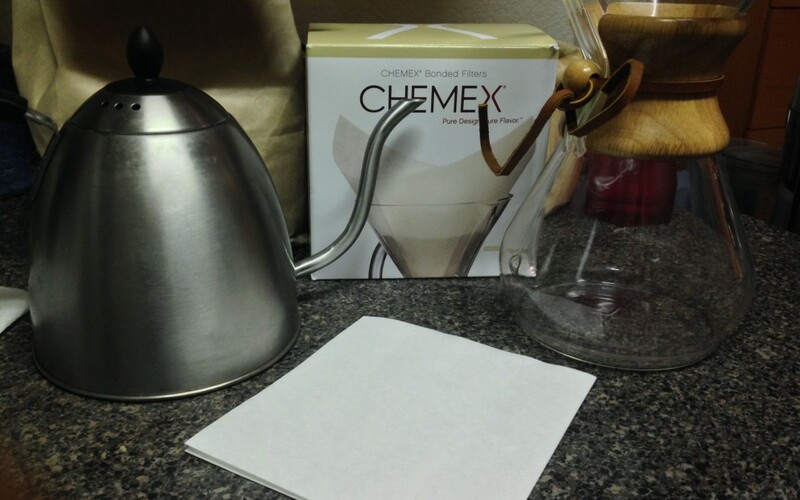 What are the steps to brewing with a Chemex? While the water is coming to a boil, fold your paper filter to fit the Chemex, next weigh out your coffee beans and put them in the grinder (but don’t grind them yet!). Once the water is ready put the filter in, open it up, and pour some hot water into the filter that is in the Chemex to rinse the filter, pour the water out once your done. Pour the hot water gently over the grounded coffee, bringing the water to where it is just covers the coffee, wait for it to go down and repeat as needed until you reach your level of desired coffee. 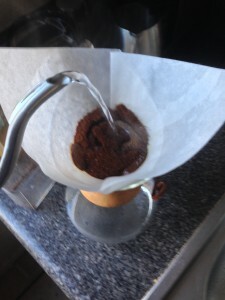 Throw away the coffee grinds, and filter in the Chemex and serve. That is it! All there is to the Chemex!